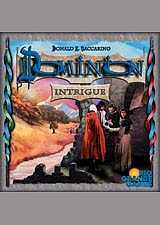 Dominion Intrigue can be played by itself or combined with the original game Dominion. For players new to Dominion, it is recommended that you start with the original game; Dominion. Dominion: Intrigue adds rules for playing with up to 8 players at two tables (if you combine it with the original Dominion) or for playing a single game with up to 6 players (combined with the original Dominion). Alternatively it can be played completely stand alone with 2-4 players. This game adds 25 new Kingdom cards and a complete set of Treasure and Victory cards.